Did you have a dream about a train? In this post we'll share the meaning of dreaming about trains, railroads, train stations, tracks and more with these common train dream interpretation examples. There are many common themes we see in dreams of trains. If you have a dream where trains are present, it is helpful to think about whether any of these themes may relate to you in your everyday life. In order to best understand which theme is most applicable in your dream, it's important to think about the details of the dream and the different moods and feelings you might have felt while dreaming of trains. Your own personal experiences can also greatly influence what the individual meaning might symbolize for you. 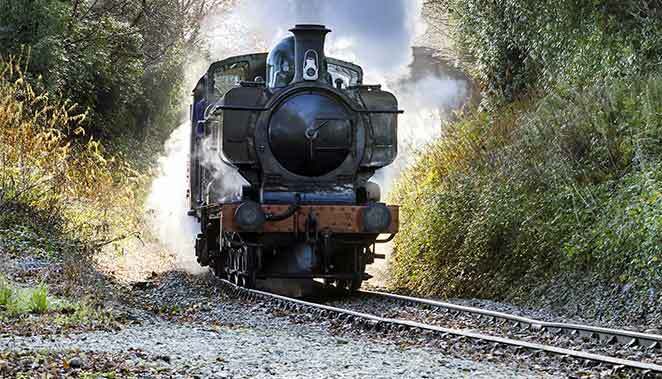 How have you encountered trains in real life? Someone who worked professionally in the railroad industry may have a different meaning for someone who has experiences with trains and train cars in a war environment. If you ride a train in the city to work every day, this is different from someone who lives in a rural setting who hears train whistles from a distance across a river. All these little things are important to take into consideration in order to understand what this dream means for you. While all of these things may not seem important on the surface, they make a big difference! In order to have an accurate dream interpretation it is very important to consider the dreamer's personal experiences with the dream symbol. The way someone feels about a particular symbol is going to help them understand the way this feeling may manifest in a dream to signify feelings of something in their waking life. Your Path in Life: Are You on the Right Track? Dreams about trains can mean you are thinking about the path you wish to travel in life. 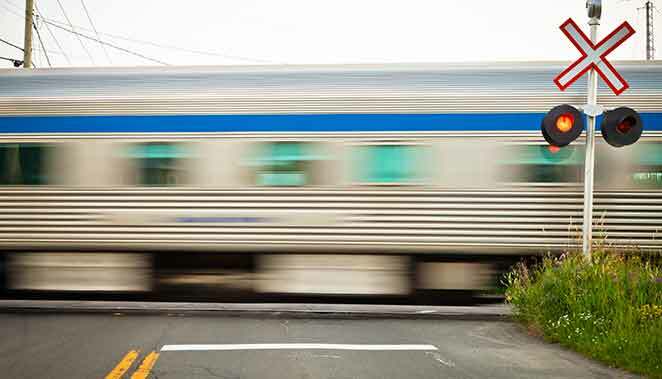 To dream of a train can often give you insight on whether you feel like you are on the right track in life or if you feel disconnected from others. Seeing railroads and train tracks in a dream often means you are thinking about your goals and directions in life. These roads and pathways in dreams often reflect our own choices and decisions we make each day. Do you know where you are going or where you want to be in life? You may be looking for something in your life that offers structure and stability. Freight trains and locomotives are very heavy, powerful machines. The average rail car weighs over 200 tons, and when you consider just how many cars can be in a line, many of these processions can easily weigh 5,000 tons or more. This sheer weight can require a lot of power and strength! For this reason, many times when a train appears in a dream it can mean that something affects us in a very strong and powerful way. This is especially true if one notices details such as a loud noise or even the powerful vibrations of a train going past. Railroads connect us all across the world. We can travel easily from city to city across countries. Even the individual cars on a train are connected together. Many trains can go on for hundreds and hundreds of feet long because it is easy to connect different cars to each other. For this reason, this dream symbol can often appear in our dreams as a sign we desire connection with someone or something. You may want to connect with new people - or you may want to connect with new opportunities. You may also be thinking about how to "connect all the dots" in order to get from point A to point B. Trains operate on a schedule and a strict time table. For this reason, we can sometimes associate trains with timing or even as a symbol for the past, present, and future. The use of trains and railroads as a form of transportation in our world has a very rich history. Trains exist in nearly all parts of the world. In times of war, trains were used to transport everything from supplies to prisoners. In these instances, a cargo train may be a symbol for thoughts, memories and feelings we are still carrying from the past. Trains also played a very important role in economics and delivering materials to others. They made it possible to transport very heavy and large items. Now that we've shared some of the basic common themes, let's talk about specific instances where you might experience a train in your dream and the dream interpretation for each scenario. Signs and signals in our dreams can often be a very literal sign and message. Sometimes these messages come as warnings or simply as an awareness in our consciousness. If you ever had to sit at an intersection for a long time waiting for a train to pass, you know this can be a very slow and long process. When you experience waiting for a train to cross in a dream, it could mean you are currently experiencing delays and obstacles in reaching your current goals. A long line of train cars can mean that you feel like you have a lot of responsibilities or details to pay attention to. You may be feeling stressed or overburdened in your current daily work. This can also sometimes mean abundance and plenty of new opportunities. You may feel like there is no end or limit to what you are able to achieve. You may be hopeful and optimistic about new possibilities in the future. If you happen to notice the engine and first car of the long line of cars, you may notice it is steam powered or even possibly a diesel engine. If you dream of steam from an engine that runs on water, it could mean that you are blowing steam or even feeling a lot of pent up emotions and frustration. If you see smoke or ash in the dream, it could mean you are feeling confused or uncertain about your productivity and current goals. Diesel is a type of fuel, so looking at the dream meaning of gasoline can also be helpful in understanding the dream further. This is especially true if the diesel aspect seems to be an important characteristic of the dream you remember. Most of the time when we think of railroads, we assume the train will be going down the tracks. Of course, in dreams we are not limited by what happens in our physical reality! Sometimes you can see a train traveling through the clouds or even across a wide open field with no type of rail to guide it. This type of dream typically means you are in need of some sort of guidance in some aspect of your life. Maybe you are not sure whether or not to take a job offer or you are considering making some sort of large change in your life. You might have some worries about upcoming events and are wondering what you should do. In these cases, it is often helpful to ask others what they may feel about a specific situation, especially if they have a lot of experience and expertise on the subject matter. It could be a sign that you just need to find someone to give you a guide to the right direction. Occasionally, we will have a dream where something is blocking the pathway of the track, or there is something we must remove from the tracks. The obstacle in the dream is often a metaphor for the different challenges and problems we face in our day to day lives. Take a moment and think about how you feel about your current daily life right now. Are there any challenges you are currently experiencing? If the objects are small, and relatively easy to clear on your own, then it is usually considered to be a good sign that you will be able to continue on your path without a lot of difficulty. Are the obstacles large and difficult to move? This could be something like a fallen tree or even a broken down car stuck in the middle of the tracks during the dream. Often times, when we see something like this, it usually means we are feeling very much stuck or blocked in our current life. You may need to ask others for help in order to overcome this challenge, or you may need to think of a different, more creative solution. Think about how you felt and reacted in the dream when you realized you would not be able to cross the obstacle. This can give you a lot of clues to discover how you feel about your current life challenges - and maybe even some creative ways to deal with them! Another possibility with very difficult to cross obstacles is that it is a symbol for a certain person in our life. Is someone standing in your way of your success? Do you feel as if you are confronting someone in your day to day waking life? Some times these sorts of dreams will reveal new ways to deal with solving problems and resolve conflicts with others. A passenger train can reflect that you wish to connect with others, or that you may feel disconnected from others. Think about what type of people are riding with you. Do they have any noticeable characteristics that stand out? Pay attention to how you feel in the dream - do you feel good about riding with other people or do you feel overwhelmed or crowded? Sometimes people appear in our dreams as a symbol of an aspect of ourselves. Many people travel by rail to get to work, especially in cities or if they need to travel for business. If there are any other themes in the dream that relate to working at a job or traveling in a city, it could mean you are considering possible new business ventures. See related dream symbols: Dreaming of Workplaces and City Dream Interpretation. Another thing to consider is many people also enjoy miniature railroads and model trains as a personal hobby. We often associate these miniature railroad displays with the holidays, because many people have a tradition of putting a small toy train around their Christmas tree. To see a toy train in a dream can signify that you might not be taking a very important issue very seriously. Sometimes, depending on the context of the dream, it can mean that you feel as if others are not respecting you or giving you the credit you deserve. You might feel like they do not view you as an authority or you may even feel powerless in a situation. 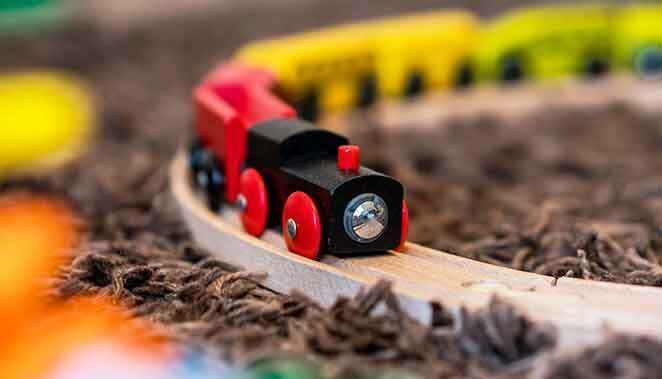 Another possibility is that certain types of toys or miniature railroads may be a symbol for a person you once knew or nostalgic feelings of the past. For example, I cannot even think of trains without thinking of my uncles who absolutely loved everything about them. As a kid, we often played with toys and would build tracks all around the house. Dreaming of a train station can be a symbol of transformation and waiting. You may be in a place of uncertainty, or you may be wondering what the future may hold. You may be feeling like you are running out of time to make a decision. A cargo train is a special type of train which normally transports goods and materials. This can sometimes mean boxcars full of packages, or it can mean oil tank cars on the tracks. One thing to consider is whether this symbol in the dream might represent anything you are carrying with you. For example, packages in a boxcar could represent different thoughts, feelings, or memories you have. To understand what the cargo might represent for you, it is helpful to ask yourself what the track might represent. Does the track symbolize a longing to connect with someone or something? Is the track a symbol for your current journey in life? Sometimes when we dream of an object, it can actually mean another definition for the word. For example, training can be something to teach someone new skills. We might train our dog to catch a ball or sit, stay and roll over. If you ever started a new job, you likely had to spend some time training to learn the way the company works. This is a literal play on words, where we are seeing a train in our dream because we are experience some form of train-ing in our life. This is just one example of a meaning. We even see the word train used to describe birds and fashion! This might be used as a word to describe the long feathery tail of a tropical bird. It could even be used as a word to describe the long piece of fabric that trails behind in formal dresses and wedding dresses in dreams. Here are a couple of other ways we might encounter these words in life and what they mean - sometimes our dreams can be quite cryptic when you think of the way our brain makes different associations. This is the name of a dog food brand, but also means a way of making a lot of money without a lot of effort and making it for a long period of time. If you are dreaming of eating gravy or traveling through a river of gravy, this could mean that you are looking for ways to increase your income without working harder. You may wish to find some sort of stable and steady revenue source for your business that is dependable and will sustain for a long period of time. This is an expression that is often used in reference to missing opportunities. If you miss your ride, you will not be able to get to your destination. We often hear this expression when we are late for something or we are not able to complete our goals. Ever forget what you are thinking about? This is sometimes referred to a train of thought, because we often tend to link a lot of different thoughts together in one related way. If you get distracted, you might say, I've lost my train of thought. Lay down, close your eyes and take a few relaxing and calming deep breaths. Imagine yourself boarding a beautiful train in a peaceful and relaxing setting. As you sit down on the seat of the train, look out the window at all of the different places you pass. For example, you may see a meadow, or a beautiful city, or the coast line, or even a beautiful mountain scene. You are the dreamer and the person imagining what to visualize - so you get to see anything you ever wanted to see. In dreams, the rules of physical boundaries do not apply, so you could even ride the train into outer space and visit a new planet if you wanted to! This is a great way to practice your creative skills for lucid dreaming, because soon you will learn how to drift off to sleep and visit any place you can think of. What is your dream interpretation of trains? Do you have a dream about trains you would like to share? 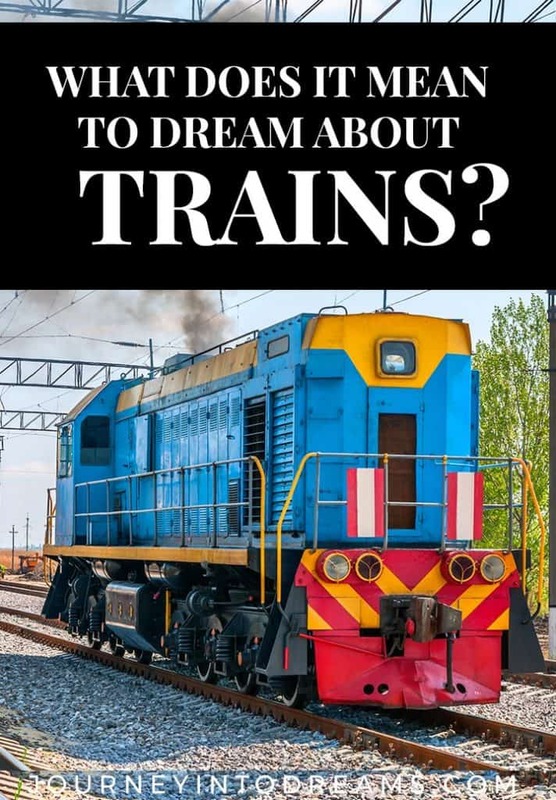 Your thoughts and experiences on what it means to dream about the meaning of a train are always welcome in the comments section below! I had a dream about a series of cargo trains running on the track, but the interesting thing is that I was trying to collect rocks from the tract.